It’s that time of year again! Many homeschoolers are finishing up their summer breaks, the smell of new school supplies is in the air, and co-ops and support groups are gearing up again. For many folks it’s Back-to-School time. There is something exciting about the fresh start of a new school year! Even though we school year round, we take a short break at the end of summer and officially kick off our new school year in the fall. I think it’s important to start the year off with a special “first day”, and it can be a great way to get your children excited about school. Regardless of your homeschool style, having some fun first-day-of-school traditions can breathe new life into your schooling and set the tone for the new year. 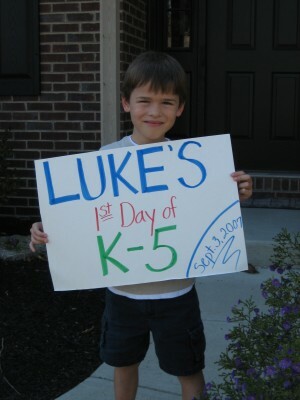 Take a picture of your child holding a sign that says “_____’s First Day of ______Grade”. You might also take this picture with your child standing in the same place each year (on the front porch or in front of a special tree, etc. ), so that you and your child can look back and see how much they grew and changed each year. Send your children on a scavenger hunt around the house for their new school supplies. I do up a new package of crayons, markers, colored pencils, and a pair of scissors in a plastic pencil box for each child to find. You could even wrap it up in pretty paper or let them decorate the plastic boxes with Sharpie markers and stickers. If you’re a notebooking family, you could let them find and decorate their new binder. You get the idea! Set up a table or other area with books and props relating to something you’ll be studying. The year we were studying dinosaurs our table included: a toy dinosaur, books about dinosaurs, a couple of fossils, some small dinosaur posters printed from the internet, and a clear container filled with small plastic dinosaurs with slips of paper for the children to write a guess of how many they thought were in the jar. 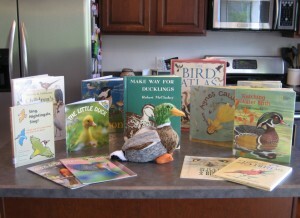 The possibilities for display tables are endless, and they are a great way to pique your child’s curiosity about a certain topic anytime of the year. Incorporate some sort of fun activity into your day. Play a game, do a fun art project or science experiment, go on a nature walk, or take a trip to the library. Please realize that we don’t do all of these things each year – just one or two. After all, it’s important to keep things simple so Mom doesn’t stress out! I hope that you’ve found something fun to try from this list, or perhaps it has sparked some ideas of your own. If so, please leave a comment and share your suggestions. May you have a wonderful first day and a blessed year of learning and making memories with your children! 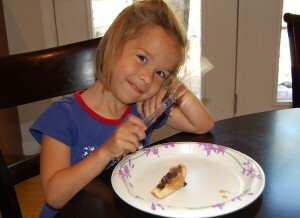 Written by Shannon, who blogs about her family’s homeschool adventures at Song of My Heart. Marcee, I’m glad you found the ideas helpful, and I imagine you’re more creative than you realize. Just enjoy your children, and have a wonderful year together! .-= Shannon´s last blog ..Checking In =-. We have a Not Back To School Party! My sister and I both homeschool our kids, so we go to a local attraction, when all the other kids are in school! Great idea!! And how wonderful that your and your sister’s kids can celebrate their first day of school together! Great ideas! Thank you. i am always looking for ways to freshen things up.